You can connect two computers together (back-to-back network) using the firewire port (IEEE 1394) found in almost all modern computers today. The firewire port has a data speed of 400Mbps, so you can have a high speed data connection to transfer files between the two computers. All you need is just a firewire cable (max. length 15ft – 5m) connecting the two firewire (1394) ports of the computers, and some TCP/IP network settings for the firewire ports, as shown below. The 1394 firewire port is fully supported in Win 2000/XP and newer operating systems. 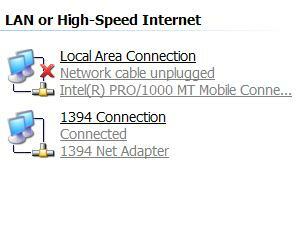 In windows, the port appears as a normal Network Connection (called “1394 Connection”) under “Network Connections” settings as shown below. On Host A, right click on 1394 Connection, click on Properties and double click on Internet Protocol (TCP/IP). Click on “Use the following IP address:” button and configure the IP address and subnet mask (192.168.0.1 , 255.255.255.0). Then click OK. 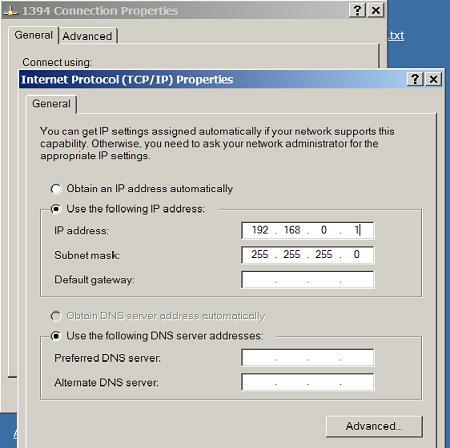 Similarly, on Host B right click on 1394 Connection, click on Properties and double click on Internet Protocol (TCP/IP). You are done!! Now you have IP connectivity between the two Hosts (PC and Laptop in our example), and you can either use FTP (File Transfer Protocol) or Windows File Sharing to transfer files and share data between the two computers.